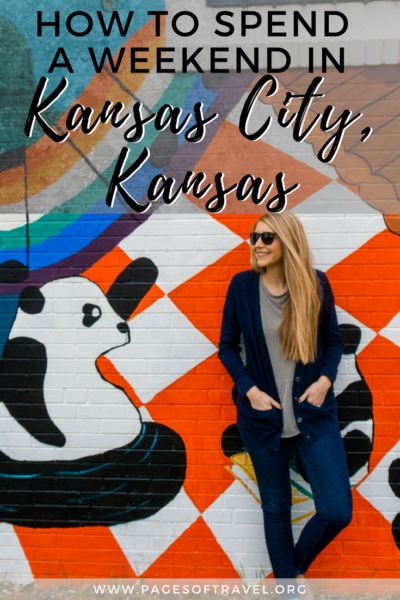 If you are looking for a place to visit on your next Midwest road trip that is full of adventure, tasty dining options, outdoor activities, and premier shopping, Kansas City, Kansas should be on your list! 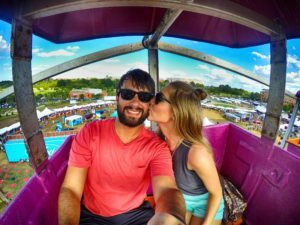 If you’re not familiar with the area and are looking for fun things to do in Kansas City for adults, here are a few activities we enjoyed during our weekend visit to the area. Disclaimer: We would like to thank the Kansas City, Kansas CVB and Kansas Tourism for inviting us as their guests. As always, opinions are our own. 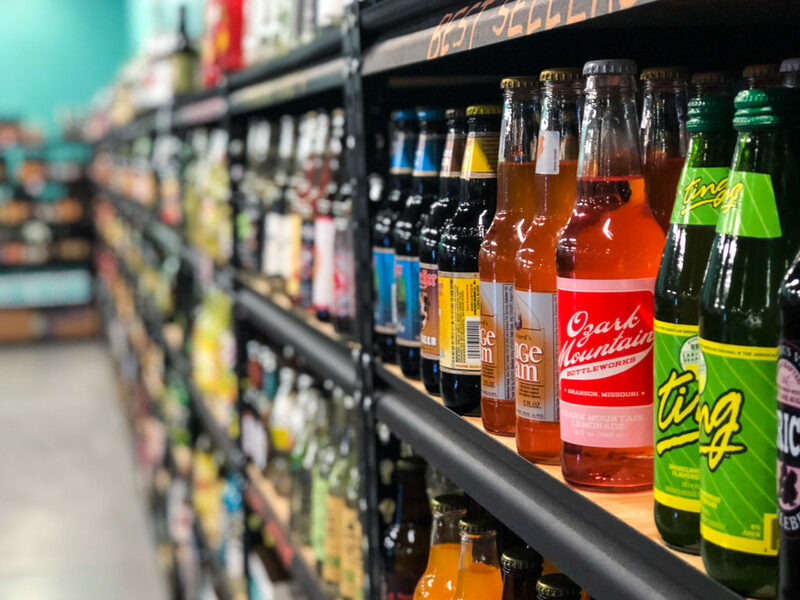 You can even find fun things to do in Kansas City for adults at the Legends Outlet by grabbing a drink at Granite City or feeling like a kid again and playing some games at Dave and Buster’s. 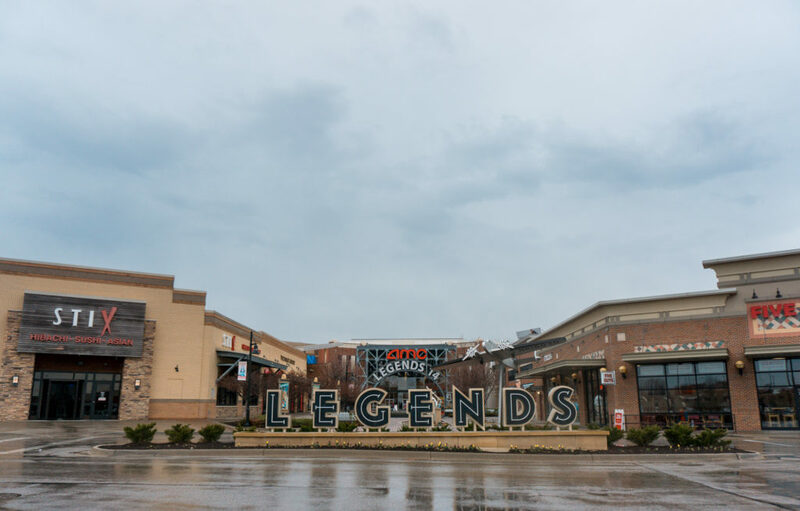 The Legends Outlets even offer a free scavenger hunt for kids (and adults alike) to pass the time if some in your party are enjoying some extended retail therapy. In the Legends Scavenger Hunt, you can discover interesting facts about over 80 famous Kansans as you search for the answers to the 12 scavenger hunt questions that at times might leave you stumped! During our attempt at the scavenger hunt, we were pleasantly surprised at how fun and hilarious our search for the answers to the riddles was! 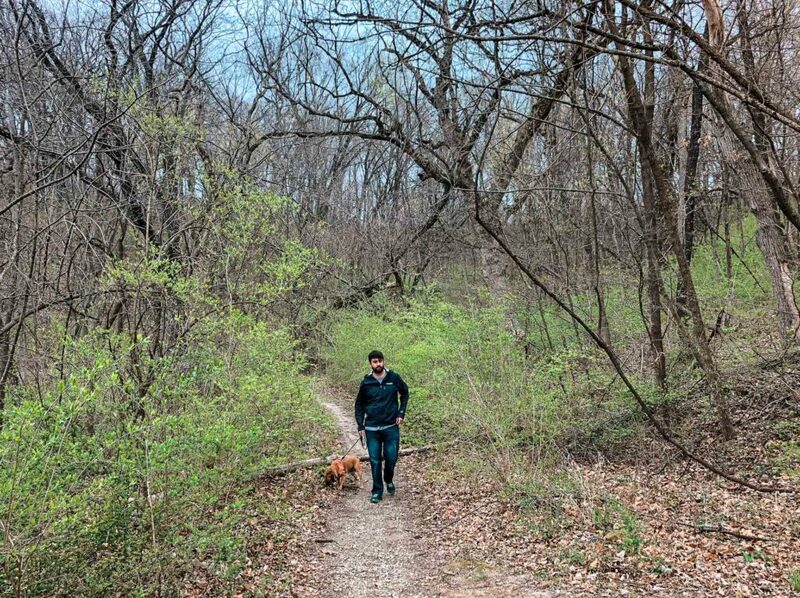 Wyandotte County Lake & Park is a tranquil place to enjoy a Saturday morning stroll or hike on its vast 325 acres. If you are looking for a place to enjoy an afternoon cookout or get together, the park offers 7 on-site shelters that have onsite water, electricity, restrooms and a playground for kids to enjoy. Wyandotte County Lake & Park also features tennis courts, softball fields, a soccer field, an 18-hole disc golf course, a skate park and a 6-hole junior golf course. 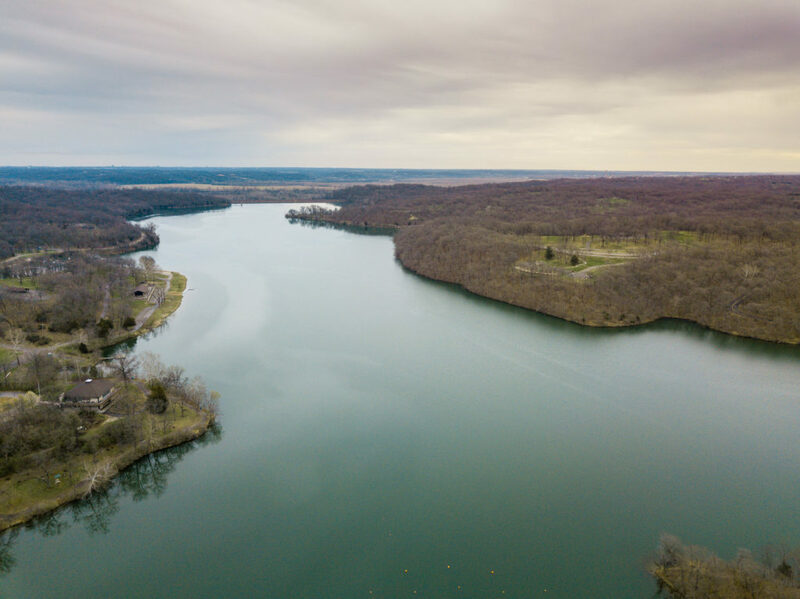 During our time at Wyandotte County Lake & Park, we enjoyed a scenic drive around the lake then decided to get out of the car an stretch our legs. We always love being able to visit a place that allows us to enjoy a location like the locals do, Wyandotte Park was surprisingly much larger than we imagined and a very nice place to relax and still be close to residential and commercial areas. The Rosedale Memorial Arch is a beautifully designed arch based on the Arc De Triomphe in Paris. It was created by a Rosedale resident, John LeRoy Marshall and dedicated in 1924 to local veterans who served in World War I. In 1993, a historic marker was added as a tribute to those who served in World War II, Korean, and Vietnam conflicts. 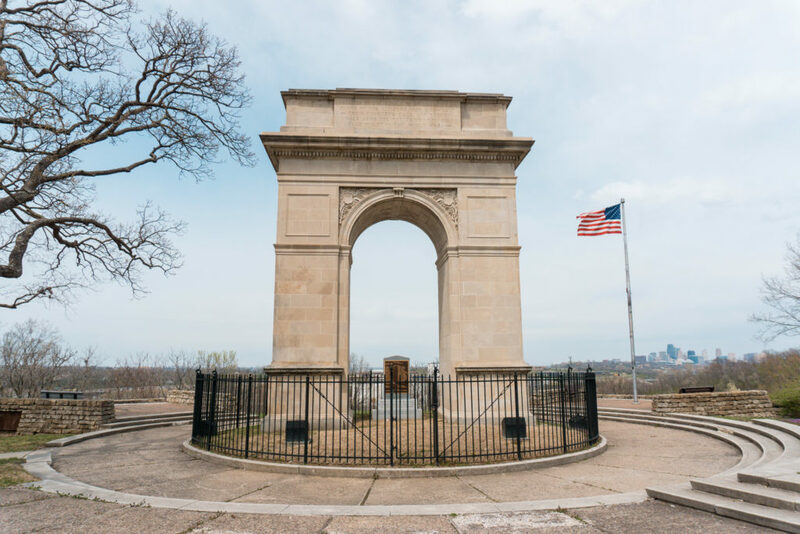 The Rosedale Memorial Arch is a majestic sight to see while it also provides an amazing view of the downtown area. We both really enjoy history and find military tributes to be personally humbling as both of Logan’s grandfathers served as did one of mine. We took time to sit on a nearby bench and discussed how sometimes we forget how much of an impact each of these wars had on families all across the country, as they still do today. Within walking distance of the Rosedale Memorial Arch is one of the starting trailheads for the Rozarks Nature Trails. 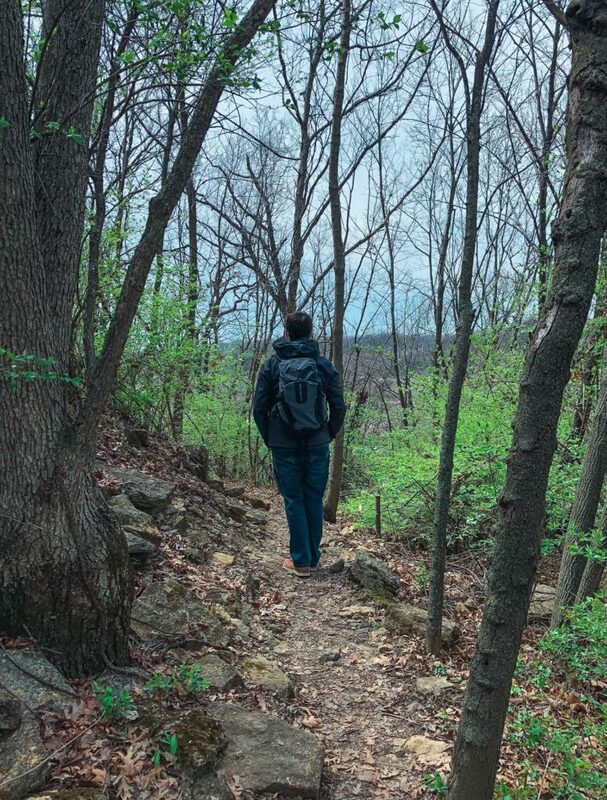 The Rozarks Nature Trails consists of 4 miles of unpaved pathways that can provide a nice place to get away from the city or enjoy a good workout depending on your pace. These trails were formed by volunteers in the community and are an inviting way to escape to scenic nature spots right in the heart of the city. We wanted to enjoy the weather a bit more since it had stopped raining when we got to the Rosedale Arch, the trail was the perfect opportunity to soak up a pleasant spring afternoon. Another addition to our list of fun things to do in Kansas City for adults and families is ziplining! 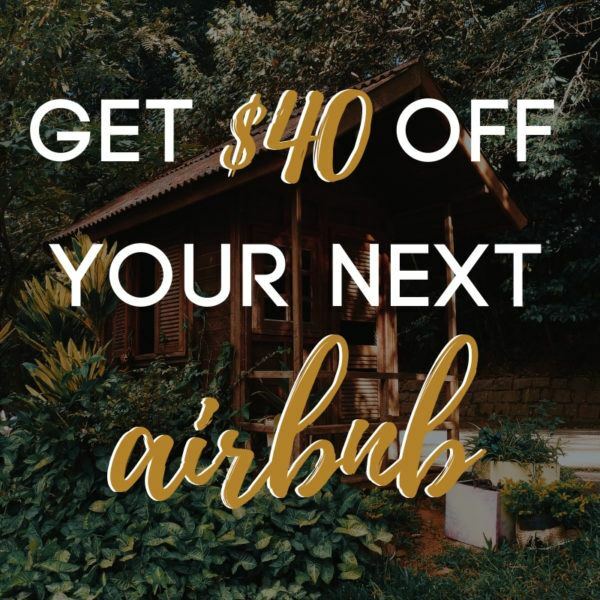 Zip KC offers the ultimate outdoor adventure right outside of the Kansas City area. There are many different zipline excursions you can choose from but if you’re looking for something out of the ordinary, The Night Flight Tower Tour is for you! With the Night Flight Tower Tour, we arrived at Zip KC just after sunset and got decked out in our zipline gear plus GLOWSTICKS. But that’s was only the beginning, we then were shuttled via bus to our first zipline spot, an EXTREMELY tall tower. We felt the adrenaline kick in as we were clipped up and prepared ourselves to fly across the line in the chilly air and complete darkness. The thrilling rush of soaring through the night sky with only a disco ball and laser lights guiding us was out of this world! At the end of the zipline, we encountered the epic zipline “trust fall” to drop down to our starting point. 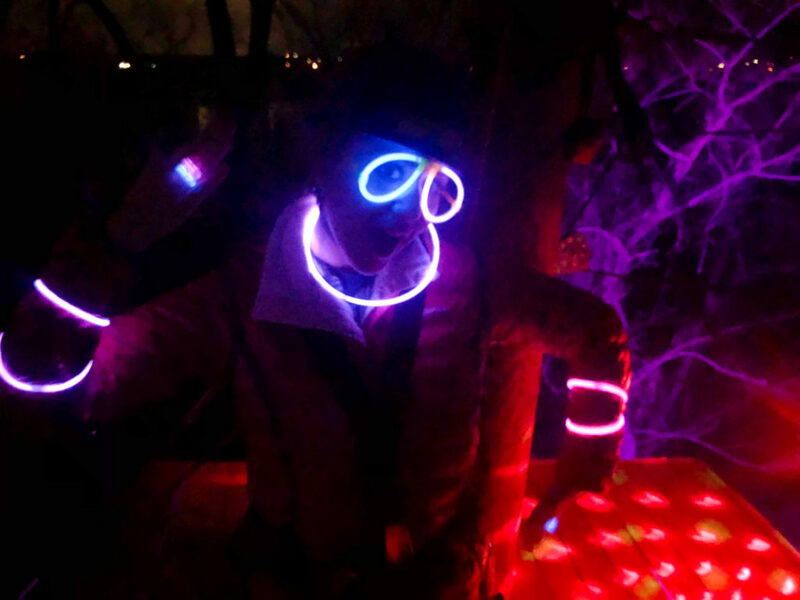 After, we encourage all to dance to the sweet beats booming from the speakers in the light of the laser beams to celebrate your thrilling zipline ride! The Avenue of Murals Project, located in the heart of downtown Kansas City, Kansas, features eight detailed and colorful murals up and down Minnesota Avenue. 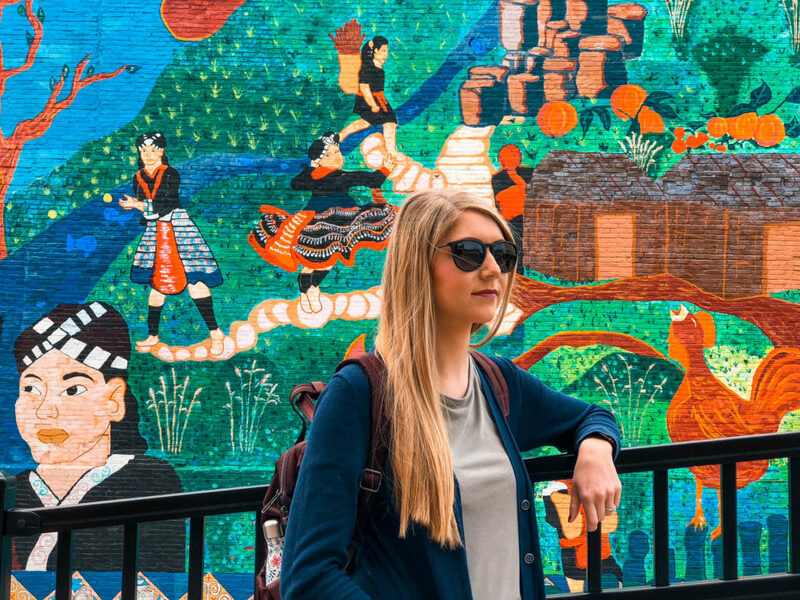 Each of the eight murals was envisioned by a group of 30 high school students who became involved in the four-year project with the assistance of professional artists. Their vision was to celebrate the history and culture of Kansas City, Kansas by representing all ties to the community. It was empowering to see their vision come to life on each of the eight walls, and a great spot to get the perfect Instagram selfie. I personally loved the cute and colorful panda mural (pictured above) ↑. It is titled “Pandatopia: Somewhere Over the Rainbow and is located on the side of a preschool. 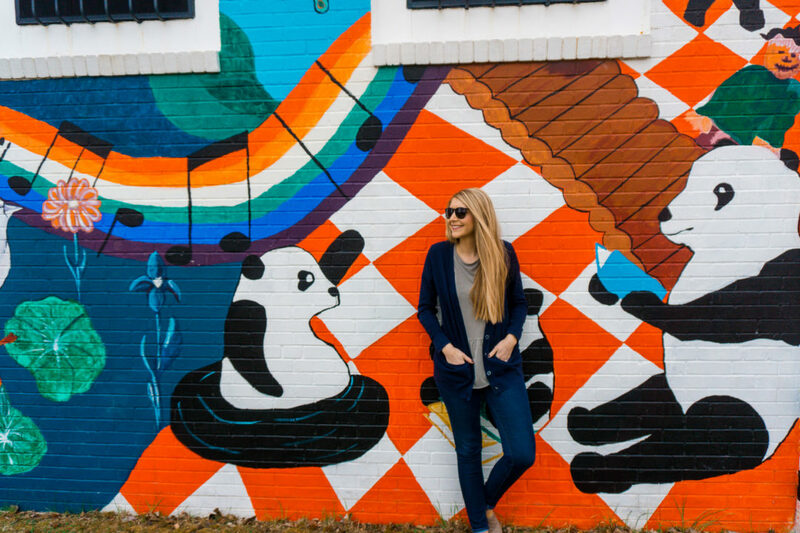 Pandatopia symbolizes the learning and discovery unlocked by books and play which, being a teacher, made me love this mural even more! One of our all-time favorite outdoor activities is kayaking! We’ve been on numerous kayaking excursions in all different places but our experience on the Kansas River was one for the books. First, travel to one of the iconic Lewis and Clark Expedition stops by visiting Kaw Point where the Kansas and Missouri rivers meet. 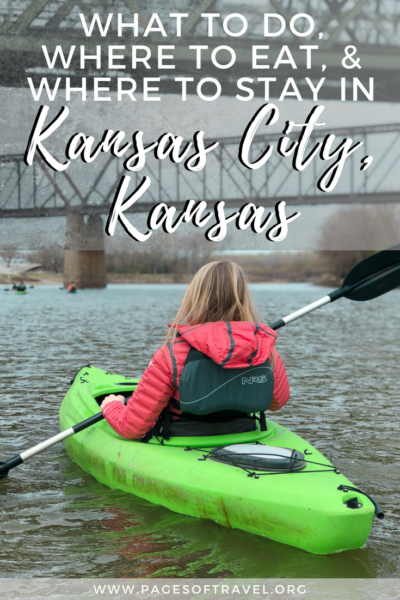 Kaw Point is located in the center of Kansas City, Kansas and has a stunning view of downtown Kansas City that you can enjoy from the nearby trails but even more so from your kayak. 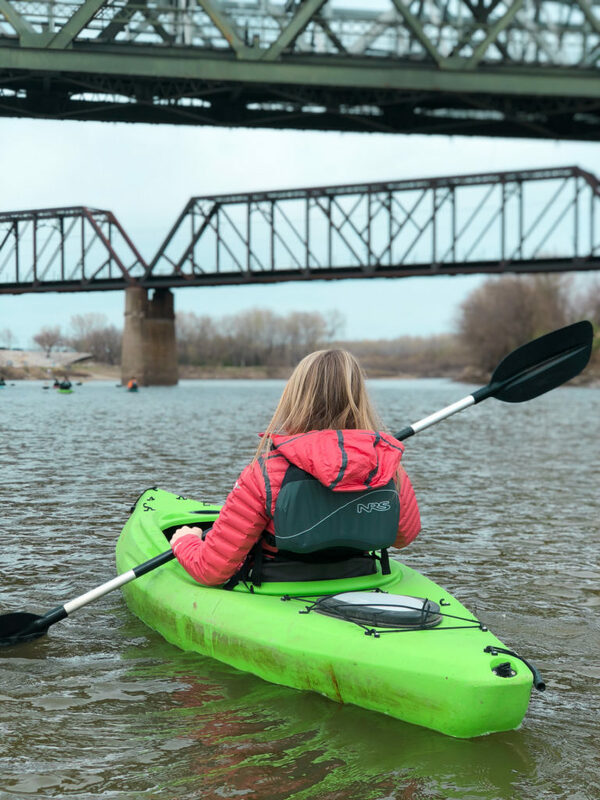 After exploring Kaw Point, immerse yourself in the calm waters of the Kansas Rivers with your rental from KC Kayak & Canoe. KC Kayak & Canoe offers hourly rentals of kayaks and canoes to use on the Missouri or Kansas Rivers. If preferred, you can even opt to have a guided tour of the area. We found that kayaking the Kansas River was the perfect outdoor activity to enjoy on a beautiful spring afternoon. Do you have a need for speed!? At the Kansas City Speedway, you can have a one-of-a-kind experience to become a racecar driver behind the wheel with a trained professional in the passenger seat. If driving a racecar isn’t your thing, you can even ride shotgun for three wicked fast laps while a professional racing instructor is driving you. While we were not able to enjoy the Richard Petty Driving Experience due to inclement weather, it is something we will most definitely be coming back to Kansas City for. At Jazz, A Louisiana Kitchen you can walk in feeling right at home in this relaxed environment. Jazz has been bringing authentic French Quarter cuisine for over 25 years. 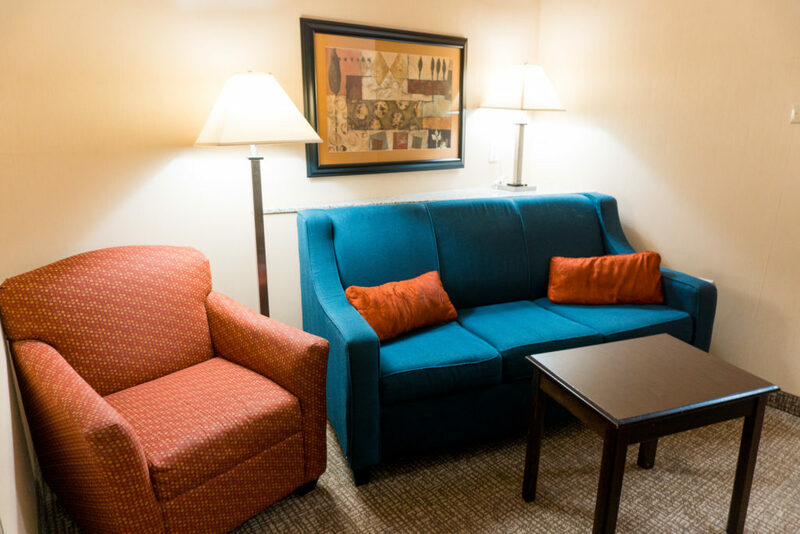 During our visit, we greatly enjoyed the friendly staff, the upbeat live music, and the comfort food cooked to order. Think you can only get crawfish in Louisiana? Think again! Jazz offers amazing crawfish dishes on their menu including the Voodoo Crawfish Tails appetizer that will tingle your taste buds. 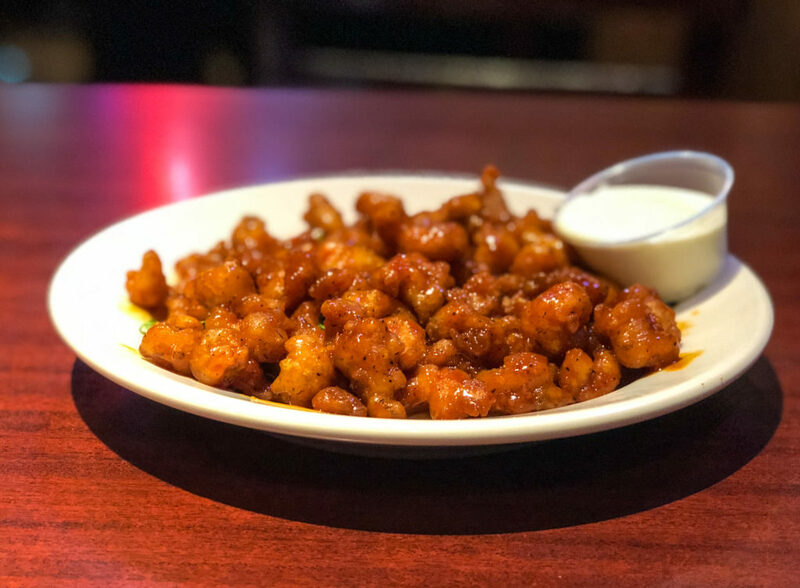 These crawfish tails are breaded, fried, and coated with a spicy voodoo sauce for an extra kick. For entrees, Jazz has a bountiful menu including Cajun and Creole-style foods. We ordered the popular Chicken A La Mer and the Stuffed Catfish. 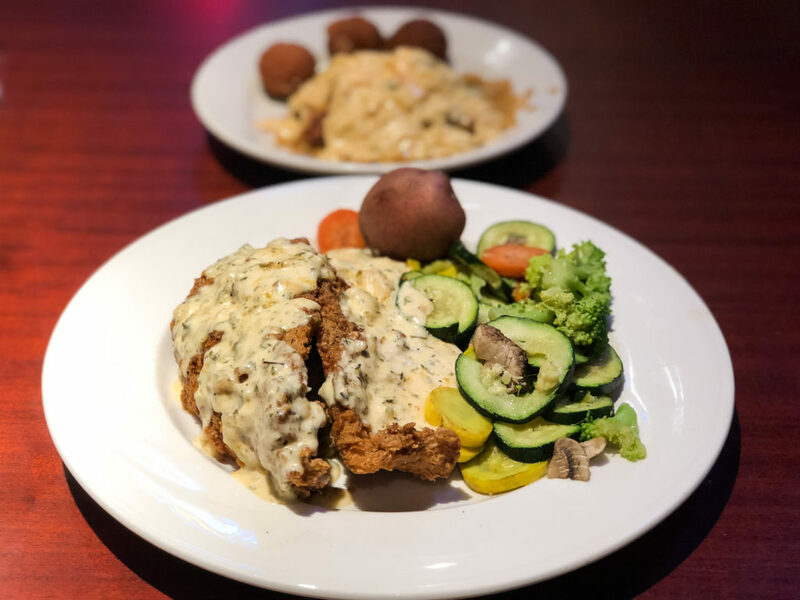 The Chicken A La Mer is a chicken dish topped with a shrimp and crab parmesan cream sauce and served over a bed of rice with a side of freshly cooked vegetables or hushpuppies. Whereas the Stuffed Catfish includes two flour battered catfish fillets placed on top of Jazz’s seafood stuffing and topped with a cheesy alfredo sauce. The Stuffed Catfish also comes with a side of new potatoes and freshly cooked vegetables. Looking for something sweet after all the spice? Jazz also offers fresh beignets that are topped with a light dusting of powdered sugar and served with a side of Chantilly cream sauce. After a meal at Jazz, we practically rolled out to our car and vowed to celebrate Fat Tuesday more than once a year by indulging in these comfort foods. If we told you we found some of the world’s best BBQ in a gas station would you believe it? The vision for Joe’s Kansas City Bar-B-Que started in 1990 after Jeff and Joy Stehney attended a barbecue competition and fell in love with the smoke, the sauce, the friendships, and competition. They decided to buy their own smoker and form their own team, known as the Slaughterhouse Five to compete in the world of barbecue contests. Soon after, they started winning many contests, word started to spread, and partnerships were formed with Joe Don Davidson, founder, and owner of the Oklahoma Joe’s Smoker Company to create Oklahoma Joe’s Barbecue and Catering. In 1997, Jeff and Joy bought their share of Oklahoma Joe’s Barbecue from Joe Davidson after he moved to Texas leaving them with one of the most hopping barbecue joints in the country. 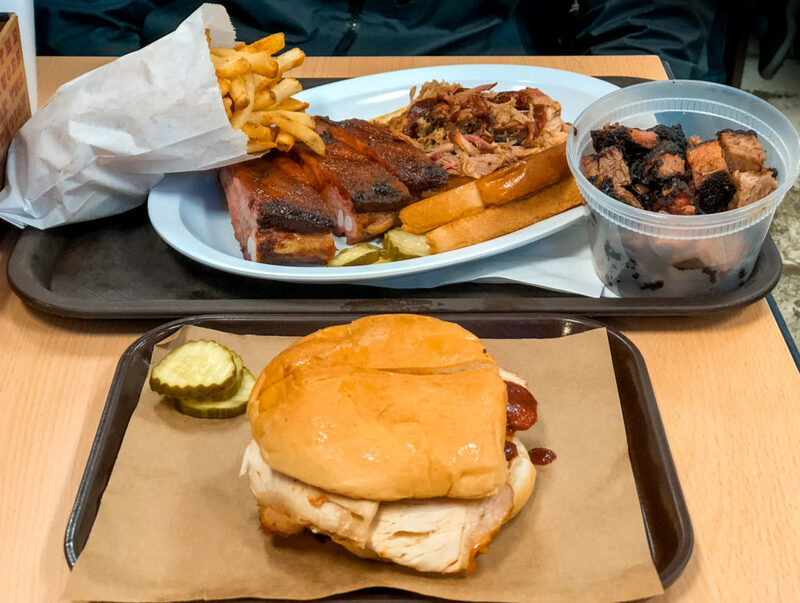 While Joe’s Kansas City Bar-B-Que has three locations, we highly recommend visiting their original gas station location to enjoy the timeless and iconic feel of this barbecue’s past. Growing up between St. Louis and Memphis, two cities that are known for their own variety of Bar-B-Que, Logan was acting like a kid on Christmas morning as we pulled into the parking lot. As we waited in line he was furiously making notes on the paper menu when I noticed he had a sad look on his face. I asked what was wrong and he told me that he couldn’t figure out how to try a little bit of everything he wanted. When we made it up to the counter, the nice gentleman taking our order, almost like a BBQ stained tee shirt Saint Nicholas, informed Logan that he could order small portions a la cart of the legendary burnt ends. Fighting back tears of joy we also ordered pulled pork, ribs, and smoked turkey as our entrees. The mouth-watering, fresh-out-of-the-pit meat was heavenly and we found out first hand why some of the nations top chiefs hold Joe’s in such high regard. One thing’s for sure, when visiting Joe’s Kansas City Bar-B-Que you better get there early cause the line gets long but it’s so worth the wait! You might miss the subtle Vietnam Cafe when you drive by, but this local favorite has been voted as the best Kansas City Vietnamese restaurant numerous times! The authentic Vietnamese cuisine ranges from Pho, a rice noodle soup, to more hearty dishes like Banh Xeo, a crispy rice pancake. We ordered a bowl of Pho (beef broth soup) with chicken and a bowl of Hu Tieu (chicken broth soup) with chicken and shrimp. The bowls were both savory and exceptionally filling. One thing we loved about these dishes was all of the extra garnishes provided. 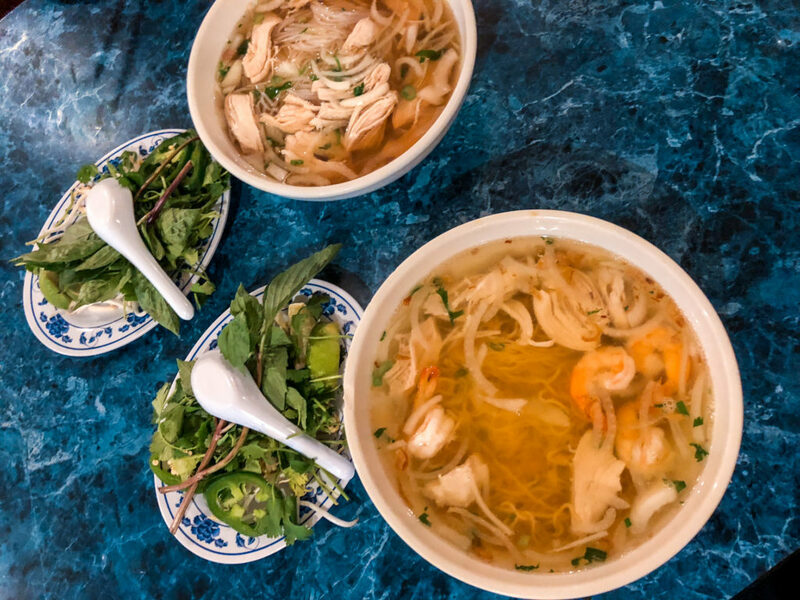 All of Vietnam Cafe’s broth-based dishes are served with a side of fresh bean sprouts, sweet basil, cilantro, jalapeno, and lime wedges to add your dish to your liking. Vietnam Cafe brings out the traditional flavors of Vietnamese food in their entrees which will leave you wanting more of these reasonably priced dishes. Address: 2200 W 39th Ave. Located in the heart of downtown Kansas City, Kansas, El Camino Real offers fresh Mexican fare for extremely affordable prices. This hole-in-the-wall restaurant has many menu items to choose from but what we found notable was their street tacos. 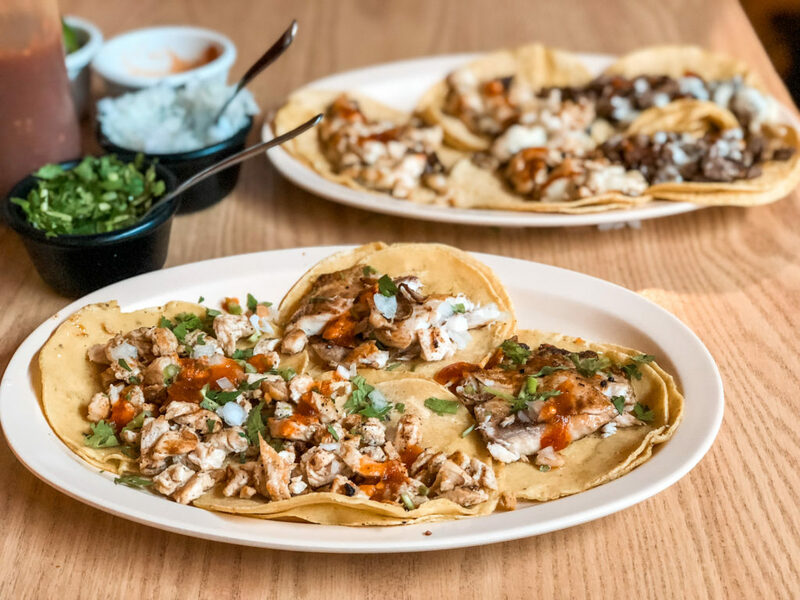 Each corn tortilla is freshly pressed, placed on the grilled, and cooked to perfection before being served with a variety of meats such as steak, pork, chicken, fish. All side items are brought to the table to dress up your tacos with their signature spicy salsa, onion, cilantro, and/or lime wedges. While we were dining at El Camino Real nearly every table was full! We had a chance to talk with a couple that was sitting close to us and they told us that they drive 30 minutes every Sunday to enjoy a meal at El Camino Real and we can see why. 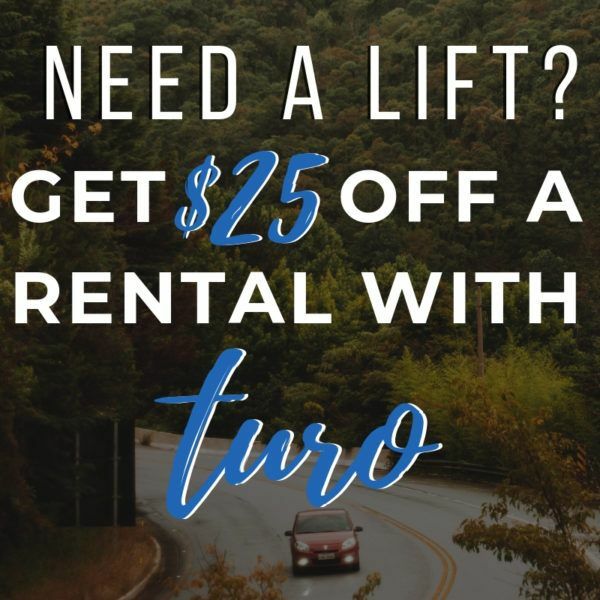 You may find us driving back for more every weekend alongside them! Needless to say, these tacos are exceptionally tasty. 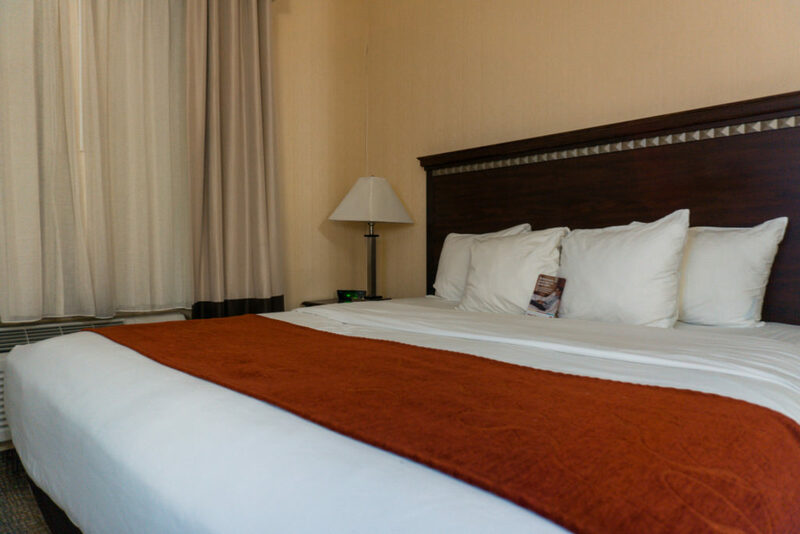 If you are looking for a no frills place to stay that is located within minutes of Kansas City attractions, shopping, and dining, The Comfort Suites at the Speedway is in a great location! We loved that the Comfort Suites at the Speedway offered pet-friendly rooms for our dog, Bentley where he felt right at home. They also offer daily complimentary breakfast which we enjoyed each morning. 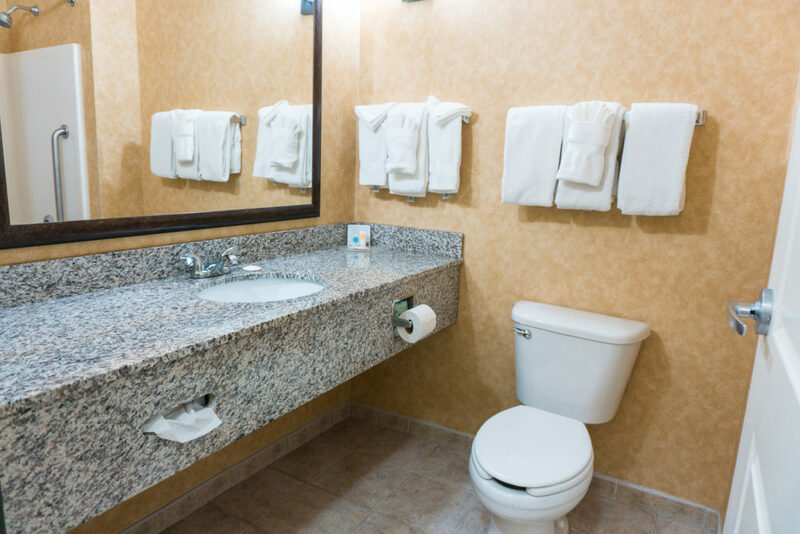 Some other added perks that the Comfort Suites at the Speedway provides for their guests is access to their indoor pool, a decent sized fitness center, and a convenience store area to pick up small items such as snacks, drinks, and toiletries. Thanks for the great ideas! We enjoy visiting KC and we have found a gem of a bed and breakfast to stay, http://jeffersonhousekc.com/. The Boulevard Brewing Company and The Roasterie offer wonderful tours! That lake view is just incredible!! Looks like such a fun weekend! 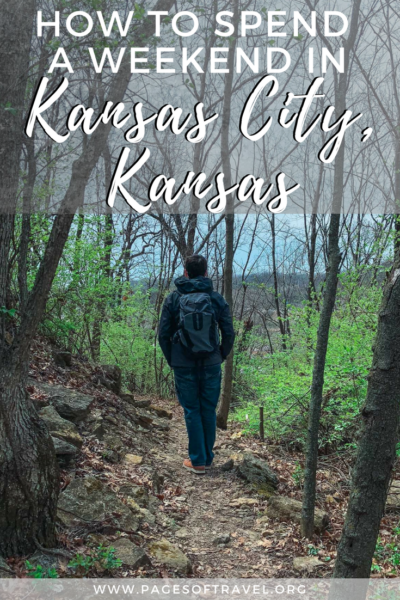 I love how many outdoorsy things there are to do in Kansas City – I had no idea. To be honest, Kansas hasn’t ever been on my radar. I’m terrified of tornados and The Wizard of Oz scared me out of my wits. Now that I’m a little older, I think it’s time to give Kansas a shot. I love that you can take a tour of the murals in downtown and have an alternative zip-lining experience! We were just near Kansas City, visiting my brother who is stationed at Leavenworth, but didn’t get a chance to go into the city. 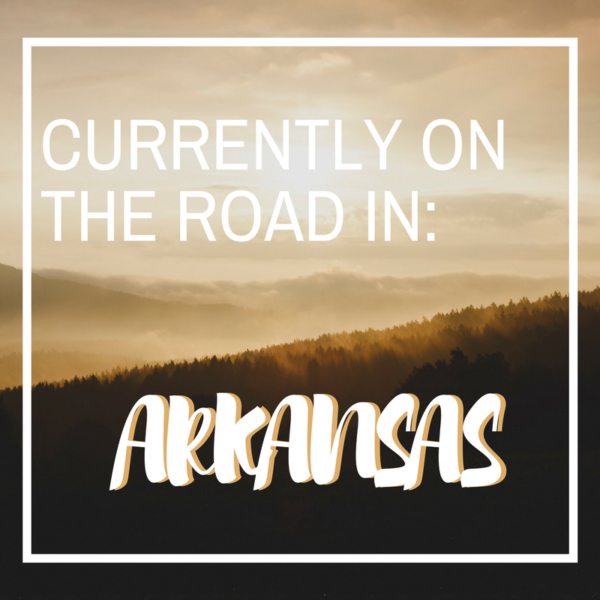 We opted for Weston, which was great and a little closer, since we were only there one day, but we have plans to go back through on our way back east and really hope to stop through KC! Thanks for all these awesome tips! I would love to do the driving experience and we are always down for a good paddle and some BBQ! !